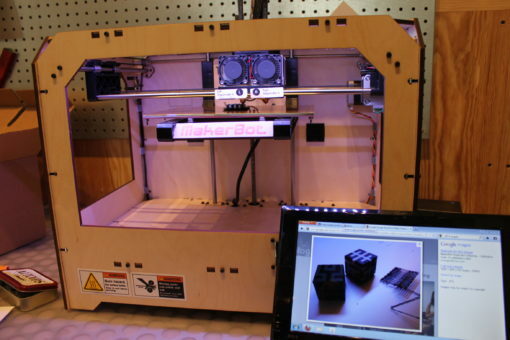 How many of you have ever seen a 3D printer before? When I asked the eight kids, ages 9-12, in the 3D Modeling and Printing workshop at Mt Lebanon Public Library, three of them raised their hands! What’s even cooler than that, is that the other five had not, but they decided to sign up for and attend our free workshop anyway, just because it sounded interesting and they wanted to try something new. We brought our 3D printer with us to the library to show the way in which it creates three-dimensional objects out of melted plastic. There were lots of great questions about what it’s capable of. Each of the kids then sat down at a computer. 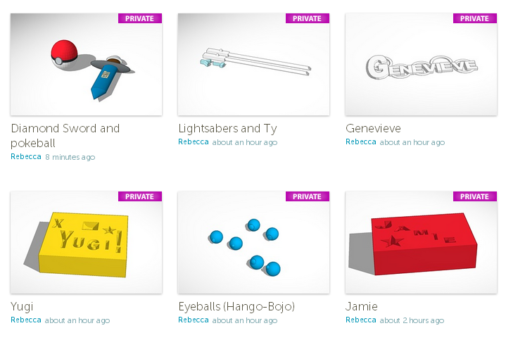 We explored several different online tools for 3D modeling, and talked about how different programs are good for different purposes, like prototyping engineering parts or making characters for animated movies. Even though it was everybody’s first time using these tools and we had some technical problems, everybody was willing to experiment and struggle and try different things. By the end of the two hours, everybody had an interesting project. There wasn’t time to print the models while we were at the library, but we will, and the kids will be able to go back to the library to pick up the physical pieces that they designed.